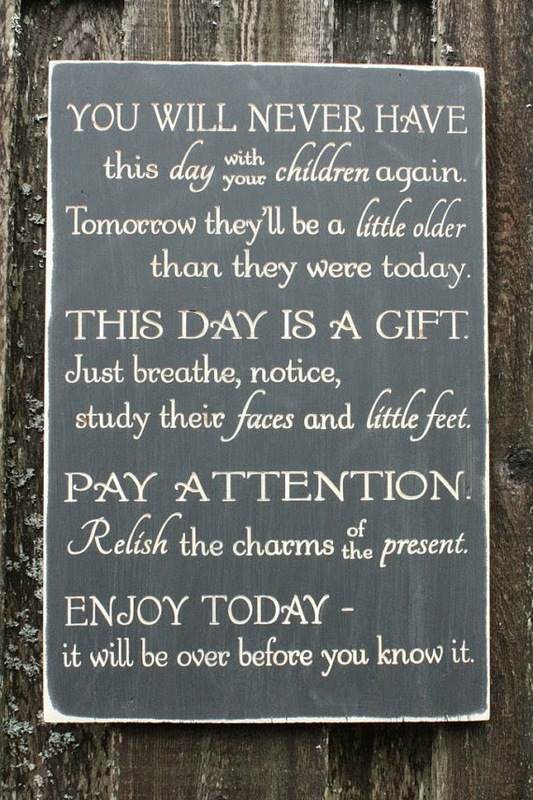 I know, I know: cherish every moment of your kids' childhood. They'll never be this age again. You'll miss it when they're older. Watch them, listen to them, let it all sink in, because it's precious and you blink and it's gone. It's obviously good advice, seeing as I've heard it from virtually every older mother in the Western hemisphere. I get it. I do. I even pinned this sign to my Pinterest yesterday to remind myself, and then literally ugly-cried for ten solid minutes because OMG MY BAAAAABIES ARE GROWING UUUUUUUP!!! But y'all? It's so hard sometimes. And then I feel like an epic failure as a mother because I'm unable to fully appreciate every last ounce of cuteness and sweetness in the face of the irritating things they subject me to on the daily. People are always asking me why I take pictures of stuff like this ... of foody kids and poopy smears on my wall/sink/floor and messes of such gigantic proportions that you just have to stand there and stare at it and let it register for a minute. Why do I take pictures of these things? So that I can appreciate my kids. Later. Because in the moment, "good, conscientious mothering" dictates that I should chuckle and say, "Awww, look how adorable he looks with all that food smeared across every square inch of himself!" But let's be real: that's not what happens. What happens is that "reality mothering" kicks in. The part responsible for the cleanup and the extra work involved that, frankly, I'm not looking forward to doing. The nostalgic and emotional part of me recedes softly into the background while the rational part bursts onto the scene like, "Damn it!" I can't help it: that's just how it happens. It's an involuntary reaction to such things. - What did you expect, ya moron? You gave him his own. Bowl. Of Beef-a-Roni. - He has to have a bath now. At lunchtime. He'll be dirty again by this evening. - His shirt. Geez. I hope I have enough stain remover. - I need to get that right in the laundry. After the bath, I guess. Ugh. - It's going to take me forever to scrub all that off of his high chair. - And off of him, for that matter. I'm gonna be fishing chunks out of the tub. - I hope he doesn't touch me. How am I going to get him out of there without him touching me? But deep down, that nagging voice is saying, "You should be enjoying this. He's growing up so fast. It won't happen for much longer." 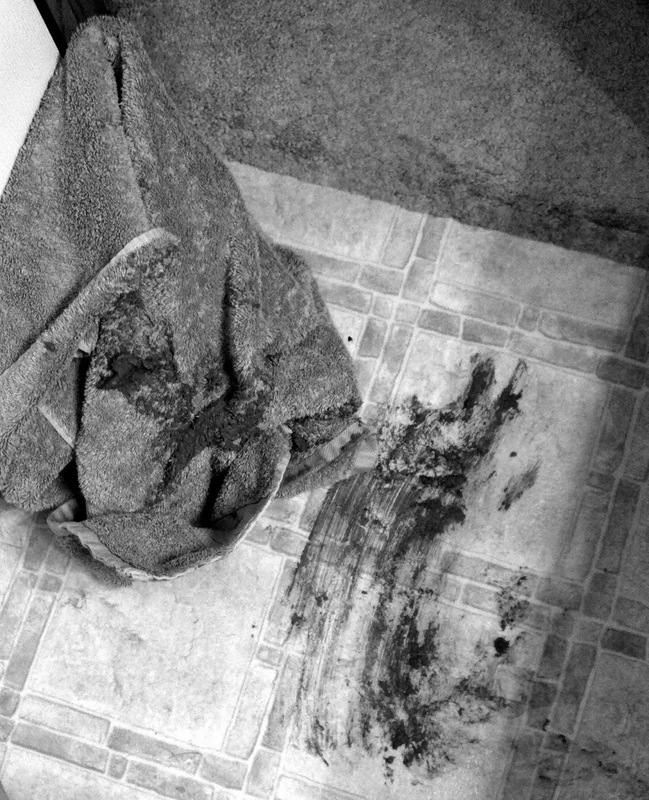 ... Because poop is slightly less disgusting in black and white. I'll look through them and laugh, and remember all the ups and downs of my kids' littleness. And probably congratulate myself on not completely losing it between now and then. DON'T FORGET - I've still got two giveaways going on: Original Stitch and Downy Wrinkler Releaser Plus! Click on the "Giveaways & Reviews" tab to enter! I love your blog, and I love your premise of fighting the frump, but this is a perfect example of why I embrace the frump. Well this, and laziness. I'm a 67 yr old woman who has survived two boys. I still catch myself standing agog (short for gobsmacked) at my sons today, with very vivid memories of just such pictures of your experiences, and wonder, "Are they the same people that lived in my house?" I am grateful they grew up healthy and happy, and I'm grateful I did not end up in a sanitarium drooling onto my bib. I have not laughed so much, ever, as when reading your experiences and looking at your pictures...and I guess that is the good news. I can now, 60 years later, truly laugh at it. Susan, this is one of the sweetest, most poignant comments I've ever received, and you give me hope that my boys will turn out normal. Well, at least a little more normal than they are now. ;) Thank you so much!